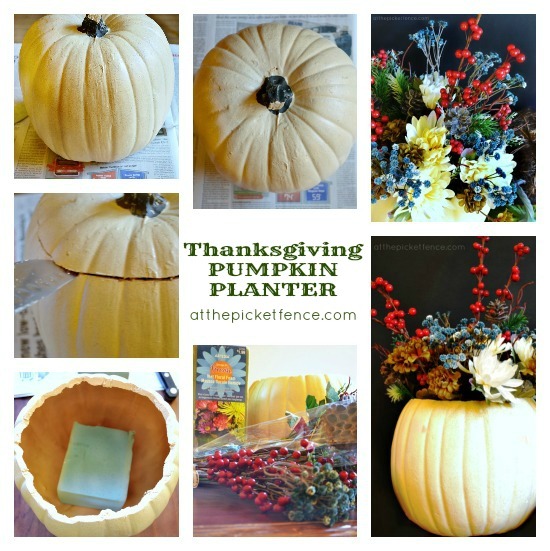 Here’s a fun and easy Thanksgiving Centerpiece idea that won’t break the bank! It’s getting to that time of year when easy and frugal sounds fabulous when it comes to holiday decorating! 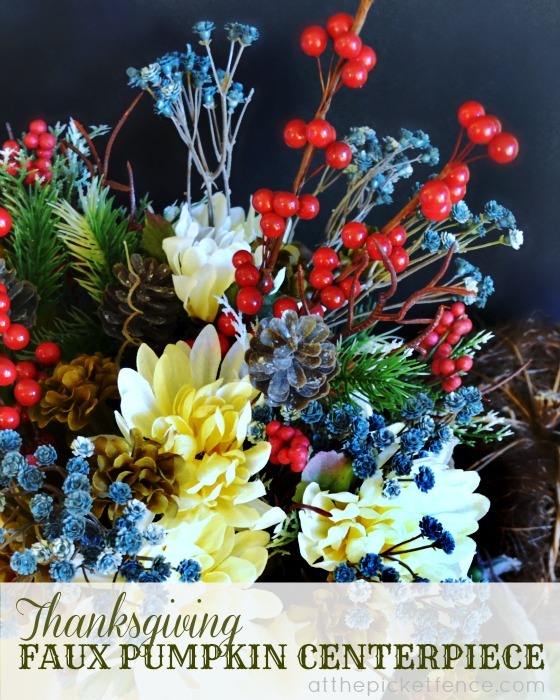 I first saw a version of this easy Thanksgiving centerpiece idea shared on HomeTalk by Barb of The Everyday Home and thought it would make a great centerpiece for Thanksgiving! 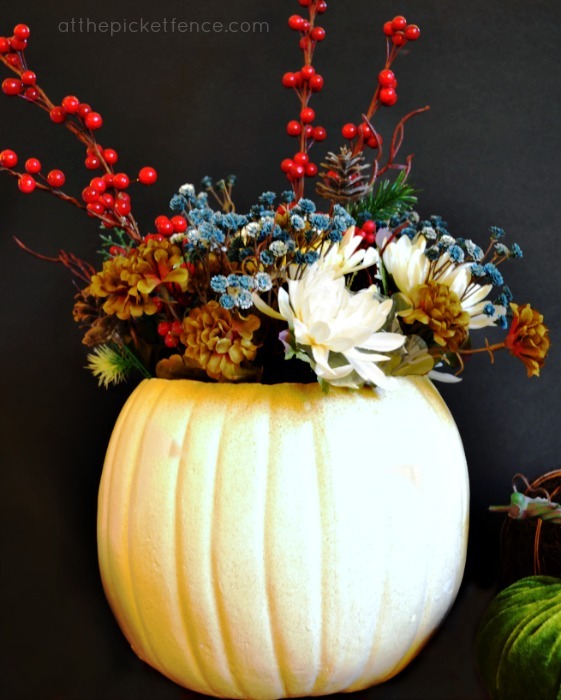 Here’s my version of this fabulous faux pumpkin planter! 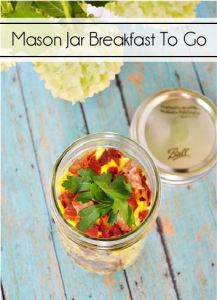 This is such a quick and easy project, and with fall decor going on sale well before Thanksgiving a frugal one as well. Faux flower stems or Real Flowers. and for the tutorial you can watch this video put together by HomeTalk where Vanessa and I, along with our friend KariAnne of Thistlewood Farm, share 5 great “Decorating on a Dime” projects! Vanessa will be showing you a re-cap tomorrow of her projects and you can see KariAnne’s fabulous mantel over at Thistlewood Farm! I really love how this Thanksgiving centerpiece turned out! I was able to use colors that compliment my dining room decor, but this would also be beautiful with mums, ornamental peppers or even some gorgeous red and orange leaves! During this busy season don’t let time and money stop you from creating beautiful holiday decor! Make sure you are following along with us through November and December as we share many more easy holiday decorating ideas, recipes and inspiration…right here At The Picket Fence! 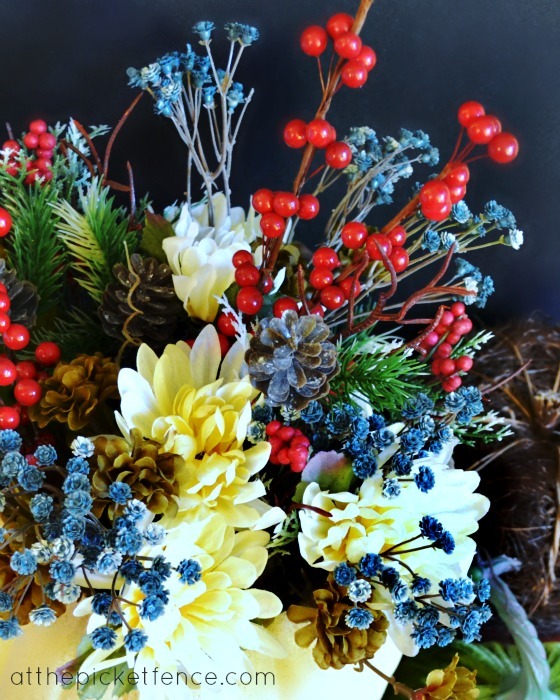 13 Comments on "An Easy Thanksgiving Centerpiece Idea"
Very pretty, Heather! It makes for a great Fall centerpiece. I don’t know why I thought cutting those pumpkins would be difficult. This is something very traditional and very lovely that I’ve always wanted to do with one. It looks so pretty! Lovin’ the new “post” link next to our names, here, in the comments form…it’s another fantastic way to see more creativity! 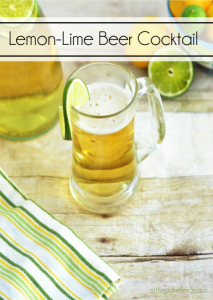 Can you tell us is a post how it’s done? You are the first that I’ve seen to have it added! Love this easy enterpiece and love the video! I’m hooked on these fun videos!!!! Keep them coming girls! Heather – Beautiful centerpiece. Will be wonderful for Thanksgiving. Seriously! That was so much fun! I loved hanging out with you and I wish we could have all gone out for coffee after! You are both rock stars! That’s really a great centerpiece. 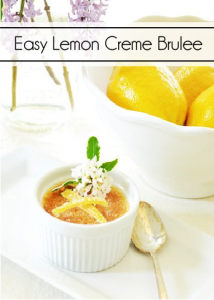 I have to pin this and try to make it for Thanksgiving. Thanks for the inspiration. Very Pretty! I’m all about easy these days. I just don’t have the oomph to be complicated. This is such a great idea for Thanksgiving, Heather. I love anything quick, easy and inexpensive that turns out as pretty as your flower arrangement did!